False confessions happen many ways for many reasons. Juveniles, people with mental fatigue, and people with diminished capacity are more likely to bend under police pressure. False confessions can result from interrogations where the police suggest lighter punishment, or leniency from police, prosecutors, judges, and ultimately jurors. False confessions can also be motivated by threatening inevitable consequences, or denying a citizen’s rights. Juveniles and persons who are mentally or psychologically impaired are particularly vulnerable. Being held in a small windowless room, and isolated from family and friends, can lead to mental exhaustion. For example, a suspect who knows he is guilty of driving under the influence, and is intoxicated, may be pressured to confess to another crime he did not commit in order to avoid additional questioning and police pressure. You have the constitutional right to stop the questions. Just remain silent and ask for a lawyer. For thousands of years governments have beaten confessions out of their citizens. The United States Constitution was written to correct earlier abuses. However, it was not until 1936 that the United States Supreme Court told police to stop using torture to obtain confessions. Ed Brown was charged with murder in Mississippi. He denied responsibility so the police strung him up from a tree and hung him by the neck. Then they whipped a confession out of him. He was convicted at trial using that confession. The United States Supreme Court reversed Brown’s conviction because his confession was not voluntary. Brown v. Mississippi (1936) began a new chapter in police interrogations. The prosecutor, John C. Stennis, was later elected to the United States Senate and served 42 years, never losing an election. Thirty years after Brown v. Mississippi, the United States Supreme Court handed down Miranda v. Arizona (1966). The Miranda rule states that when a suspect is in custody (under arrest) and interrogated (questioned), the police must inform the suspect of his right to remain silent and right to counsel before the suspect’s statement can be introduced in court. Understanding these rights, he waives them and agrees to make a voluntary statement without an attorney present. The prosecution bears the burden of proving the accused waived his right to remain silent. Miranda warnings were implemented as a safeguard to assure that confessions are voluntary. The constitutions of the United States and Mississippi guarantee the right to remain silent. Miranda rights are required before the government can use a suspect’s statement in court obtained by a custodial interrogation. If you would prefer to talk to your lawyer before answering any questions, just say so. After Brown, the Supreme Court required confessions to be voluntary. During the next decade, a Chicago policeman named John Reid began developing a technique for extracting confessions from suspects. His legacy is now called the Reid Technique. It relies on building rapport, testing reliability by asking control questions with known answers, and interpretation of body language to detect lying. Critics say it is accusatory, confrontational, and presumes guilt. The Reid Technique begins with the investigator identifying the most likely suspect. The investigator assumes the suspect is guilty. In fact, the investigator tells the suspect there is no doubt he committed the crime and everyone knows it. The investigator tells the suspect what happened in a calm, understanding, patient manner. The investigator will build rapport and sympathize, offering different scenarios to explain why the suspect did it, and offer to see what can be done to work this out. The Reid Technique has nine steps to lock down a confession. The investigator will tell the suspect the evidence points to his guilt and that is why he is here at the police department. The investigator will get the suspect to explain what happened and why. The investigator will then offer the suspect an opportunity to justify the crime. The investigator may blame others for the suspect’s situation to put him at ease. The investigator may get the suspect to justify what he is accused of. By doing this, the investigator gets the suspect to admit the crime. The investigator discourages the suspect from denying guilt. If the suspect offers reasons why he did not commit the crime, the investigator will ignore or refute those reasons. The investigator will appear sincere and empathize with the suspect to encourage the suspect to let his guard down. The investigator will tell the suspect everyone will understand. The investigator will get the suspect to become quiet and listen. The investigator will discuss alternative reasons why the suspect committed the crime and supply key details from the crime scene, so the suspect can later repeat them. If the suspect cries, the investigator will assume guilt. The investigator will help the suspect justify his actions, offering alternative scenarios as to why the suspect committed the crime. By admitting any justification for the crime, the suspect admits guilt. The investigator will tell the suspect confession is good for the soul, and the suspect will feel better after confessing. While the suspect is also free to say that he did not commit the crime, the investigator will not offer that option. The investigator will have the suspect admit his guilt in front of police witnesses to lock in the confession. The investigator will record the admission or confession (written, audio, or video) to include in the case file. The Reid Technique is effective at leading a suspect to believe confessing is in his best interest. The Reid Technique relies on isolation from family and friends. Welcome to the small, windowless interrogation room. The Reid Technique has been criticized for producing many false confessions. Juveniles, people with diminished mental capacity, intoxicated persons, and those with limited education are at greatest risk of false confessions. You have a United States Constitutional fifth amendment right to remain silent. Ask for a lawyer and stop the interrogation. The PEACE model of interrogation was developed in the 1990s in England. Law enforcement enlisted the aid of psychologists to reduce the number of false confessions which result from overly aggressive interrogations. PEACE is the standard interview protocol in many western countries but not the United States. Preparation and planning. The interrogation is not a fishing expedition. The interrogator must know the facts of his case and develop a list of topics to cover, clarify the purpose of the interview, what needs to be covered, and how to locate evidence. Engage and explain. The police will build rapport with the suspect and explain the purpose of the interview. The officer’s tone should be relaxed and non confrontational. The officer should make the suspect comfortable so he is willing to communicate. Account. The officer will ask the suspect what happened and tie down the details. The interrogator will encourage the suspect to remember what happened using either a cognitive approach or conversational engagement. In the cognitive approach the interrogator asks the suspect to recall and describe the events under investigation. The interrogator will talk about how the suspect was feeling when the crime happened. It is important for the interrogator not to interrupt or ask leading questions. Instead, the interrogator will use pauses to get the suspect to fill in the gaps. The interrogator will then ask the suspect to describe the event again, from a different perspective or in a different order. Conversation management by the police begins by asking the suspect what happened. The interrogator will divide the story in to sections and cover each section in close detail. The interrogator will summarize each section and fill in all gaps in the information. The interrogator will then question the suspect’s version where it is inconsistent or differs from the physical evidence. The interrogator should not be aggressive. Instead, he should ask the suspect to clarify his understanding of what happened, and allow the suspect to explain. Closure. The interrogator will summarize the main points of the statement and allow the suspect to correct any errors. Evaluation. The interrogator will evaluate his performance to determine whether he built rapport, achieved his objectives, and whether he needs more information. PEACE interrogations are a way for the police to put a suspect at ease and get him talking. Unlike Reid questioning, the PEACE model is also effective with witnesses. You have the absolute legal right to remain silent. Just tell them you would rather talk to your lawyer first. An admission is a statement made by the suspect regarding an element of the offense. A confession is a clear statement of the suspect’s guilt. Every confession contains an admission, but not every admission is a confession. In Mississippi, evidence of the crime should be introduced at trial before a confession is admitted into evidence. This means a suspect’s confession, standing alone, is insufficient to convict. The suspect’s confession must be corroborated by independent evidence of the crime. The Innocence Project reports that 25% of convicted criminals who were later exonerated had confessed. False confessions can happen in a number of ways. Voluntary false confessions have the appearance of being freely given. For example, sometimes people falsely confess to benefit another party, such as when a parent confesses to keep a child out of jail. It is well documented that people also confess to notorious crimes to get attention. Compliant false confessions are sometimes made to avoid stress, or obtain leniency. A suspect who makes a compliant false confession knows he is innocent. He confesses anyway because the interrogation process has become overwhelming, or the police promise leniency. The compliant suspect feels that the short term benefit outweighs the long term consequences of confession. Internalized false confessions are those where the person believes he committed the crime. Memory lapse, alcohol/drug induced blackouts, or coercive interrogation techniques are a dangerous recipe for false internalized confessions. False admissions and confessions can result from many factors. Common factors in false confessions include mental fatigue, diminished capacity, youth, bullying by the police, false promises, fear of violence induced by physical or emotional threats of harm, lengthy interrogation, deception, persecution, and coercion. Jailhouse confessions obtained by jailhouse informants (snitches) with something to gain should be viewed with heightened scrutiny. The police can lie to induce a suspect to give a statement. Prevent false confessions by asking for a lawyer and invoking your constitutional right to remain silent. A fish gets caught when it opens it mouth . . . Regardless of the method of questioning or interrogation used, the goal of the police is to get the suspect to make admissions about the case. In court, a confession makes the prosecutor’s job easier. Confessions frequently lead to guilty pleas where the defendant stipulates to facts he stated in the confession. Tell the police you want to talk to your lawyer first. Claim your constitutional right to remain silent. If you don’t know what to say, use our business card. The most experienced Mississippi attorneys know you will not be able to talk your way out of an investigation. Retaining a lawyer to represent you early in the investigation protects your right to remain silent. Your attorney can contact detectives to find out what they want. Should you decide giving a statement is in your best interest, you can do so on your own terms with your lawyer at your side. Officer, I mean no disrespect, but my lawyer has instructed me not to talk about my case. On his advice, I hereby invoke my right to remain silent. I do not consent to any search of my person, my vehicle or my personal effects. I do not waive any of my legal rights. I request that my lawyer, identified on the front of this card, be allowed to be present if any identification confrontations, text or examinations are conducted in my case. If I am under arrest, I hereby invoke my Miranda rights and demand an opportunity to consult with my attorney prior to any questioning. I do not consent to any impoundment of my property, and I request a reasonable opportunity to secure same. If I am not under arrest, I want to leave. If I am free to leave, please tell me immediately so that I may go about my business. The Law Office of Rufus Alldredge is ready to help. Talk to us before giving a statement. Call Rufus Alldredge at 228.863.0123. 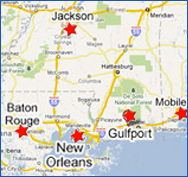 We are located at 1921 22nd Avenue in Gulfport, Mississippi 39501 close to the federal and state courts.